Want to see what has gone on in the Irondequoit real estate market during the month of October along with year over year comparisons? Here is the Irondequoit NY real estate market report October 2015 edition. In October 2015 there were 51 homes that closed during the month for Irondequoit NY real estate. This is 16 fewer homes than the 67 homes that closed in October 2014. The average sale price for the homes that closed in October 2014 was $104,065. The average sale price for the homes that closed in October 2015 was $116,372. The average market time (aka Days on Market) for the homes that closed in October 2014 was 40 days. The average market time (aka Days on Market) for the homes that closed in October 2015 was 33 days. The total amount of volume for the homes that closed in October 2014 was $6,972,350. The total amount of volume for the homes that closed in October 2015 was $5,934,953. There were a total of 143 homes in Irondequoit NY that were under contract or sale pending through October 31st, 2015 (of the 143 total homes, 43 homes went under contract during October 2015). The average market time for these 143 homes was 46 days. The average list price for these homes under contract was $117,894. There are currently 257 homes on the market in Irondequoit NY. The average list price is $124,694. The average market time for these homes is 59 days. Homes in Irondequoit NY are selling in about 30 days if priced properly. The market absorption rate, as of November 1st, 2015 was 3.98 in Irondequoit. This means that if no other homes in Irondequoit were put on the market, it would take 3.98 months to deplete the remaining homes on the market. 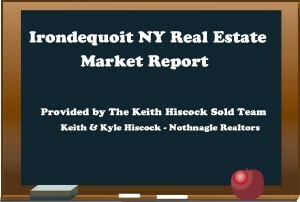 About the authors: The above information regarding the “Irondequoit NY Real Estate Market Report October 2015” was provided by the Keith Hiscock Sold Team. Keith Hiscock & Kyle Hiscock have over 30 years combined experience. If you’re thinking of selling or buying, we’d love to share our knowledge and expertise.